Relax on upper deck overlooking the lagoon. Located on Lagoon. Water sports. 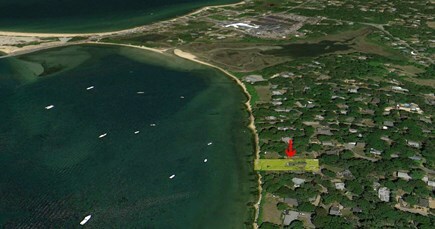 Close proximity to Oak Bluffs. 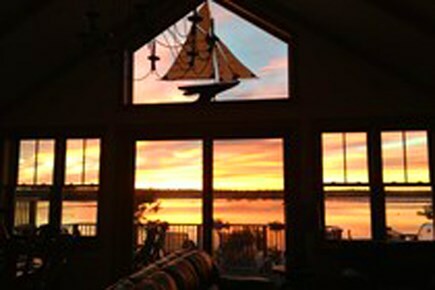 2 remaining summer weeks: June 8-15 only $3750. Aug 24-31 only $6500. Sept $4000/week. This new 2500 sq ft, 4 bedroom, 2.5 bath super energy efficient, centrally air-conditioned home is located directly on the Lagoon Pond waterfront with stairs from the back yard to our private beach (beach chairs provided). 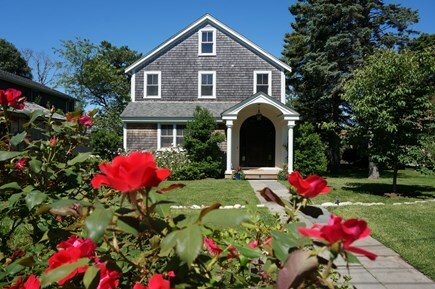 It's in a quiet neighborhood, a 10 minute walk to and through the Gingerbread coattges of the Campgrounds and on into Oak Bluffs Center. Transferable Auto reservations for are available for all remaining July and August 2019 weeks. Upside down living ....cathedral ceiling living room, dining room, chef's kitchen flooded with sunsets through glass wall...walk onto the upper deck, settle down, and enjoy the evolving evening sunset stretching across the sky and reflecting off the Lagoon and Vineyard Sound. In addition to central AC, amenities include a 65'' HDTV cable TV, Apple TV, surround sound, Internet, dishwasher, washer/dryer, BBQ grill, and outdoor shower. Sail, kayak, swim, paddle board, shell fish...on the Lagoon right from the private beach. 2 kayaks available for your use. Free mooring available for a boat. Additional availability info: Transferable steamship auto reservations are available at cost for July 6-13 and August 24-30. This is a Saturday to Saturday vacation rental. Additional pricing info: $250/ week cleaning.$1,000 security deposit. State and local taxes of 11.7% will apply. 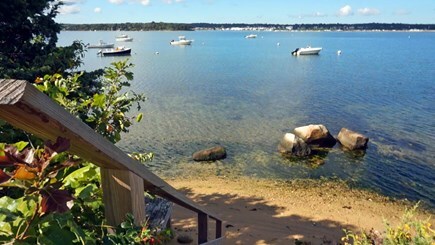 Well appointed home with a beautiful view overlooking the Lagoon at Vineyard Haven. Richard has made sure the home is stocked with all the little things that renters appreciate including but not limited to a bread machine, waffle iron, and of course a lobster pot. The home was all the more impressive considering this was a weekend where of one his family members was planning g a wedding and only a few weeks removed from knee surgery. The home is just a little distance from town center, but the views, kayaks, row boat, and private beach area of over 70 feet are well worth the trade-off. Beautiful home and perfect location! This gorgeous home is ideally located with spectacular views of the water and sunsets, and close to all of the sites. The spacious floor plan accommodated our two families - 4 adults and 3 children. It has everything you need to feel at home while you are on vacation. We loved dinners on the upstairs deck and roasting marshmallows in the backyard fire pit. Richard and Pia were great to work with through the booking process and very helpful offering advice and tips for our visit. We would love to come stay here again! 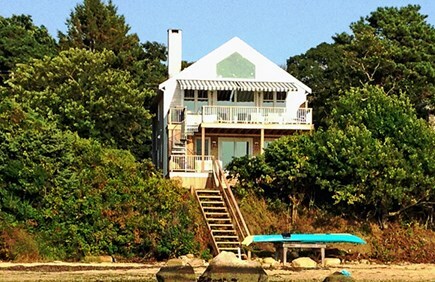 We spent a week with our family at this wonderful home, and this is an exceptional choice for a great vacation in MV. 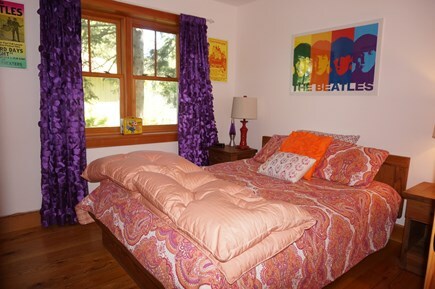 The home is exceptionally well-appointed with stylish decor, fully functional and modern design, and maximum comfort. The home features an incredible view from two decks that you can spend hours enjoying accompanied by a beach just at the bottom of the stairs in front of the property. One of the nicest features is the beautiful and well maintained yard that allows for yard games, additional outdoor dining and privacy. The home features every modern convenience including an excellent home entertainment system, beautiful appliances, central air, high end awnings on the deck, etc. The home is in a great location for moving around the island. Farm Neck is very close for golf, Oak Bluffs is walkable, and there are numerous options for entertainment, beach time and relaxing. The owners are outstanding and helpful in every way. They even helped us go clamming for the first time. We came all the way from the UK and the house, the setting and the delightful owners made our stay perfect. The house is exceptionally well equipped, comfortable and has probably the best sunset view on the island! Thank you for your hospitality Pia, it broke my heart to leave! This is a beautiful, new waterfront home that easily accommodated our extended family (total of 8 people). We thoroughly enjoyed the waterfront location.....beautiful views across the back of the home, outdoor dining, small beach area, kayaking, clamming and mooring for our rented boat. Truly, the waterfront location was the highlight of our vacation. The home is a short bike ride or walk into the town of Oak Bluffs, which makes it convenient to avoid having to drive in and park. We rented bikes from Anderson's and they delivered/picked up and were great to work with. The house still feels brand new and has a few neat features. The kitchen is a cook's delight....top of the line appliances, cooktop and cookware (did I mention the water view while cooking?). The lower deck has an outdoor (warm/cold water) shower, which we LOVED. The upper deck has a retractable awning allowing use all day. The bathrooms were beautifully done. 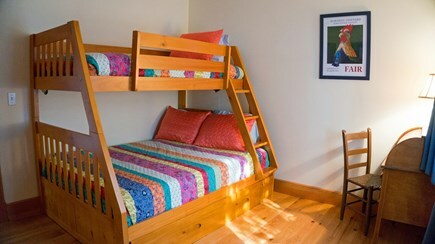 The only things lacking were ceiling fans in the bedrooms and a mattress in one room that should be replaced. We did make an assumption that the house was pet free based upon the pet restriction listed, however, the owners had a cat in the home before the summer rental season. That did limit our use of one bedroom for our children who are allergic to cats, but they were very gracious about it once we realized it (offered us allergy medicine). Richard and Pia were delightful to work with, and ensured everything was just right for our family's vacation. They provided suggestions for dining, sightseeing, bike and boat rentals, and booking the ferry. Pia even gave us "clamming lessons" and showed us how to enjoy fresh clams right out of the water! Those personal touches made us feel well taken care of. I do suggest checking ferry availability before booking, as we had to adjust our rental dates based upon when we could get ferry reservations, but that is likely just during high season. Overall, this was the perfect house for our first visit to Martha's Vineyard and if we have the pleasure to return to the island, it's the only place we'd want to stay. We rented Richard and Pia's home for a week to spend with our family on MV. We had such a wonderful stay. The house itself is beautiful- brand new and many amenities. The waterfront location was spectacular. We have two young children and it was great to be able to let them play by the water throughout our stay. It was also nice to have such a beautiful view for morning coffee, dinner, and sunsets. The house accommodated our group well and the smaller, second kitchen downstairs was great. Everything we needed was there and Richard and Pia were wonderful. We hope to be able to return with our family again. Fabulous house and location. Spectacular views! As we approached the vacation home, the owner was patiently waiting our arrival on the front step. He graciously escorted us into the house and gave us a wonderful tour, complete with instructions on the home’s amenities. The views from the second floor were spectacular! The position of the stove faced the lagoon allowing for picturesque cooking as we prepared fresh stuffed clams or clams over spaghetti squash. The home’s décor was beautiful including the tile work in the bathrooms and the stone fireplace. The days were spent enjoying this lovely home, playing in the water, clamming, and eating Smores. We are so grateful we found this home to enjoy our family vacation. Another great week on the Vineyard. The house was beautiful and had everything you could need. The kids loved clamming right off the beach and provided a huge lunch for all. We had a great time kayaking in the lagoon. The views from the upper deck were beautiful and relaxing. Can’t wait to go back. We had a spectacular week on the lagoon. Our boys were on the beach looking for sea creatures at the break of dawn! My husband and I drank our morning coffee sitting in Adirondack chairs on the bluff watching over them- It was easy and relaxing. We rode our bikes in to Oak Bluffs for ice cream and rides on the Flying Horses. The house was very comfortable. The views from the decks are beautiful and sunsets are FANTASTIC! Every night a different show! We loved our vacation ! Hopefully next time we can go for 2 weeks! We are year round Vineyard residents who rent our home (and move to a summer cottage)...and have done so for over 10 years. When we travel, we often rent homes and therefore know what is valued by you as you rent our home. We have many repeat tenants. This is our first time listing on Weneedavacation.com, so there are no reviews from tenants. Visit Homeaway.com property #3876184 for reviews from guests who have stayed at this home.